The Gillies McIndoe Research Institute opens doors for future biomedical research, for research students, and for the future treatment of cancers, says GMRI Honorary Research Associate, Dr Agadha Wickremesekera. 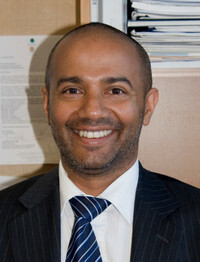 Dr Wickremesekera has been a consultant neurosurgeon at the Wellington Regional Hospital since 2000, and is also the current supervisor for neurosurgery training. He has a strong interest in research, having completed an MD in 2005 at the University of Melbourne, finding preliminary results in the expression of certain (ErbB) proteins in brain tumours. He is a senior lecturer at the University of Otago’s Wellington School of Medicine, and has 19 publications in peer-reviewed journals and one book chapter. Dr Wickremesekera began planning a project focussing on research on ErbB proteins and cancer stem cells in collaboration with Dr Tan’s team at the GMRI 18 months ago. He says this project would not have been possible without the involvement of the GMRI. Dr Wickremesekera is the principal investigator, supported by the GMRI’s team. The team has recruited a PhD student and research assistant, supported and funded by the GMRI, to work on this research project. The project, titled ‘ErbB and cancer stem cells in brain tumours’, began in August and is expected to run until mid to late 2019. The aim is to identify ErbB proteins in different brain tumours, and research their role in the formation of the tumours and their cancer stem cells. “We now have a few clues to indicate that ErbB proteins play an important role in many cancers,” Dr Wickremesekera says. “If we can show these proteins in brain tumour cells, link them to cancer stem cells and the pathways that cause brain tumours, we may then find a molecular target that could be treated, improving patients’ quality of life and survival. “The GMRI’s decision to make available their independent laboratory facilities certainly makes this project possible,” he says. Dr Wickremesekera says Dr Tan’s and Dr Itinteang’s work has changed the paradigm of cancer research – “now we’re looking at cancer stem cells, where the cancer may actually start. He says the GMRI’s strength lies in its people and collaborations. “Our aim is to produce novel data that translate into effective treatment for patients, but also to become a more sustainable research entity as well as engaging future PhD students. The GMRI has already opened many doors for research students, and we want to continue to do that,” he says. “The data we find naturally takes scientists in different, exciting research directions – maintaining a sustainable collaborative novel approach for the GMRI is a real challenge,” he says.